We’d love your help. 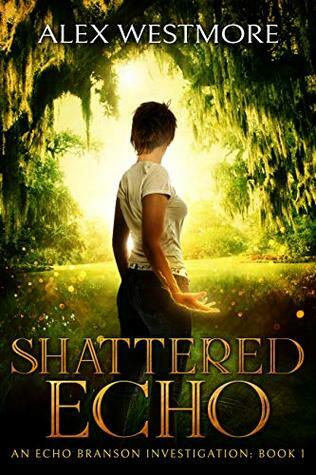 Let us know what’s wrong with this preview of Shattered Echo by Alex Westmore. "For fourteen years, she lived as an unwanted Jane Doe. Re "For fourteen years, she lived as an unwanted Jane Doe. To ask other readers questions about Shattered Echo, please sign up. I swear I've read tthis many years ago, but wasn't it written by Linda Kay Silva? A different take on the paranormal, the main character is introduced to us in flashbacks interspersed with the present day. She’s a journalist with dreams for the future, but also an empath who is finding her way and solving mysteries as she goes. Always following her own strong moral code and full of great side characters, this book was a treat from start to finish. Enjoyable and entertaining, I can’t wait to see what echo gets up to next! I didn't think I would like this book as much as I did cause it isn't the usual genre I read but the synopsis intrigued me so I thought why not. I'm not going to say much about it cause I feel like it'll be best to get into it without knowing much. What I can say is Echo is a journalist as well as an empath who wants to be accepted, achieve her dreams like any other and make a difference in the world. What I really I received a digital ARC of this book in exchange for an honest review. What I really liked about this book is its very easy to get into. It feels like your watching a very good mystery show without being pressured with everything that is happening. I was a bit dissapointed with the case at the first part (cause I was so hyped up about what really happened) but the second part made up for it. I also thought that going back to Echo's past made me undertsand her more and the connection she has with the other characters in her life. I think this is a good start to a series and I might pick up the 2nd book cause I have a bunch of questions that needs ANSWERS! "What is Tomas REAL intentions?" "Is there gonna be a relationship between Echo and a certain cop?" "What will happen to the new kid?" "Can I have one of the games the boys have?" The writing is okay in itself but the whole mystery she solved in the first half of the book was a throw away and seemed to only be there so the book wasn't really short and had no connection to the mystery in the second half of the book. The premise of her being an empath and her back story was really interesting. I'd pick up book 2 when it came out if I needed something to read and the price was low. Ok so typically this type of book is not something I would normally read. But I actually liked it! It was a very "feel good" type of book. The kind of story you watch play out on daytime t.v shows with lovable characters and funny moments enterlaced with a big time plot. What I liked about this book was that it was an easy going read that was enjoyable, without too much complicated stuff going on to bog your brain down when you really just want to f'n relax. Sometimes you need those type of book Ok so typically this type of book is not something I would normally read. But I actually liked it! It was a very "feel good" type of book. The kind of story you watch play out on daytime t.v shows with lovable characters and funny moments enterlaced with a big time plot. What I liked about this book was that it was an easy going read that was enjoyable, without too much complicated stuff going on to bog your brain down when you really just want to f'n relax. Sometimes you need those type of books. It's jam packed with delightful characters and the MC had a funny and energetic narrative that was honestly just so bubbly, you couldn't help but love it. Everywhere this girl went, she made a friend. Can't relate, but enjoyable just the same. So the story follows a young journalist named Echo trying to make it big with the news company she works for. She's stuck in the shadow of a real a**hole big shot reporter that's she's tassled with because she kind of spilled the beans on a news article he was trying to run. How did she spill said beans? Well, she is an empath who can actually feel/sense people's auras/emotions and knew that Mr. Big Shot's interview was with a big ol' liar. She was fired before it was revealed that she was telling the truth (unbeknowst to her boss and big shot that it was due to her powers) so she's given a chance to prove her worth and show that she can be good journalist. On the cusp of breaking out with her first real big story (if she can figure out the truth in time), Echo discovers that something sinister is going on when her homeless friend Bob (yes homeless. This girl is literally friends with everybody. See what I mean about feel good) tells her that homeless people are going missing and then shortly after, disappears himself. What follows is a story about Echo's past, detailing how she got her powers, how she learned to control them. You learn how the people she met in her past and things she has learned has made her into the woman she is today and how it has given her the ability to use her powers to do some good. Will she find the truth to help her break her first big story? What the hell happened to Bob? Will she get to make-out with a hot cop? How did her cat get so addicted to catnip? Well, you'll have to read it to find out. I wanted to think objectively as possible when reviewing this book, because although I may not have enjoyed it as much as I have others, it was still really good and I know that it would be a good book for someone where this is more up their alley. What kept me was the paranormal/supernatural aspect of it. Personally, I could have gone with more high stakes and less "feel good" relationships, but I still enjoyed the story and I enjoyed the characters and not all books have to be so serious. I received a digital copy of this book in return for an honest review. While I'm a sucker for detective TV shows, I don't normally find myself reading mysteries. I enjoyed Echo as a main character and thought that her empath abilities helped to fill in a lot of the issues I normally have with detective stories - she sensed people's feelings, she didn’t just “know” stuff and then explain to the reader later how she came to that conclusion through some convoluted string of clues. It added a fun twi I received a digital copy of this book in return for an honest review. While I'm a sucker for detective TV shows, I don't normally find myself reading mysteries. I enjoyed Echo as a main character and thought that her empath abilities helped to fill in a lot of the issues I normally have with detective stories - she sensed people's feelings, she didn’t just “know” stuff and then explain to the reader later how she came to that conclusion through some convoluted string of clues. It added a fun twist where she knew things, but as a reporter you obviously need facts. Kinda the reverse of the normal tropes. The plot was entertaining. I had a little trouble getting in to the two-timeline structure though. I thought both stories were interesting, but I was honestly way more interested in the current time story and felt that the flashbacks to learning about powers were good for world building, but slowed the story down a lot. I will also mention that nothing bad ever really seemed to happen to Echo – which seemed a little weird. She won every social situation she got into and always got exactly what she wanted. One thing that bugged me a lot while reading were the computer boys (this does get a little specific – so spoilers I guess? Although not plot spoilers). They were very stereotypical computer geeks, although they were even more intelligent than the normal stereotype requires. They were very much a crutch used to get information unrealistically quickly. They grab all the info on the Galloway case in like the maybe 10 minutes that Danica and Echo are talking – which is just not how that works. I’m a computer programmer in real life, and things take faaaar longer than that. I think at one point they mention off hand that they hacked the FBI database that morning, which once again…that’s not just a thing we computer people just do. This may be overly critical, but all three boys were working on different projects as well that were all projects that should have had rather large teams of developers working on them. I think one of them was making a computer game, and you need more than just a programmer to do that. Another was making an educational program that they said would make hooked on phonics look dumb or something like that – which once again…having a computer science degree does not give you all the skills to do that. Most people probably would have just ignored this stuff, but since this is what I do for a living, the unrealistic god computer boys just hit home for me. Overall, I gave the book 3 out of 5. I enjoyed the book, but it wasn’t my favorite. To cut to the chase, I did not enjoy this book. I read about 40% before giving up because I was honestly struggling to convince myself to read it. I spent a significant amount of time with this book wishing I was reading something else. I will admit that this book is outside of my comfort zone - I usually read young adult and high fantasy, but I have read both paranormal/urban fantasy and adult books before, so I don't think that's the reason why I didn't enjoy this. The main reason why I agreed to read this was one of the author’s listed genres (on Goodreads) was lesbian fiction and I am actively seeking out more queer fiction. This book is not lesbian fiction (and nor was it pretending to be; I just couldn’t find much information about the book itself). I also don’t think I was the target audience for this book – I think that’s older (as in older than me or in a later point in life – I’m 19) women. The writing style is consistently jarring. I began highlighting weird turns of phrase, awkward sentences and other things that just didn’t make sense but I gave up because there was just so much. There were so many strange decisions made, both by the characters, through their actions, and by the author, in things like the worldbuilding. It didn’t all make sense. In the nearly 200 pages I read, there was also a couple of times when something would be said one sentence and two sentences later would be directly contradicted. - Going into this book I didn't really know how I would feel about it. I've never read anything like this but I'm glad to say that I really enjoyed reading this book. - The first thing I love right off the bat was the characters. The main character Echo was interesting. I loved her personality and she had such a kind heart. Overall, she was a great character! - One thing that I really loved while reading was the friendship between Danica and Echo. There both friendship goals and I loved reading about their friendship. Danica was such a good friend and when I read scenes with both of them together it made me smile. - I found the plot to be really interesting. At first, I couldn't understand why there were two cases that Echo was working on but, it made sense as the book went on. - I loved the relationships in this book! There was a love triangle but it wasn't really a love triangle. There was the soon to be relationship, with Echo and Finn but the book goes through Echo's past relationship with Thomas. I loved reading about both relationships and seeing how the progressed as the book went on. - While reading the book switches between the past and the present. When I first started reading this book I was a little confused by what was happening and I didn't catch on to the flip of times for a while. Even though I liked reading about both the past and present I was confused by it when I first started reading. Echo est un personnage que j’aime énormément ; elle est hyper sarcastique (J’ADORE) et elle n’a vraiment pas peur de prendre des risques pour les gens qu’elle aime. C’est aussi une jeune femme qui sait ce qu’elle veut ! Elle n’a d’ailleurs pas peur de dire ce qu’elle pense à son patron et à son collègue arrogant, Carter. J’ADORE SON CHAT Tripod 🐈🐾 ; il est trop chou et me fait penser à mon propre chat 🤩🥰 A un moment dans l’histoire, elle ne sait pas comment s’habille J’ai beaucoup aimé ce livre. J’ai vraiment beaucoup aimé les personnages dans ce livre ! Je veux plus de moments entre Tomas et Echo ♥️. Pour moi c’est le point fort de ce roman. Les intrigues qui se déroulent dans le présent sont intéressantes mais j’ai préféré lire les passages qui se déroulaient à la Nouvelle-Orléans/Bayou. Cette histoire m’a permis de voir que chacun a sa place dans ce monde. Qu’il ne faut pas se laisser écraser par les autres et qu’il faut se battre pour vivre ses rêves ! We received a copy of this book in return for an honest review. Wasn’t sure what to expect from this book as it is a first from this author and genre. The book focus’ on the life of a reporter with supernatural abilities. In order to save her career as a journalist she is given a second chance with a major story. With the book set in past and present, the author allows the reader to have a better understanding of the main character. For me, I didn’t love the book and I'm not sure if I would recom We received a copy of this book in return for an honest review. Wasn’t sure what to expect from this book as it is a first from this author and genre. For me, I didn’t love the book and I'm not sure if I would recommend to others as a must read. I did enjoy some parts of it. What had me stuck was the paranormal fantasy side of the story. While stepping into the shoes of a journalist was intriguing, the constant reminder of her abilities and the four years spent training herself to use her abilities made me want to skip straight back into the present. The ending was not the strongest and made me frustrated as a reader to have it end the way it had. I wish I could choose a half star cause I’m really in between 3 and 4. I love the premise, first off, and the boys oh my goodness I think those three are my favorite characters. My biggest problem I think was the lack of definition when it started jumping into the past. I caught on pretty quick, but the first few times really threw me for a loop. Maybe it was the layout on my phone, maybe not I can’t say for certain. I also feel that this book could have easily split into two books without missi I wish I could choose a half star cause I’m really in between 3 and 4. I love the premise, first off, and the boys oh my goodness I think those three are my favorite characters. My biggest problem I think was the lack of definition when it started jumping into the past. I caught on pretty quick, but the first few times really threw me for a loop. Maybe it was the layout on my phone, maybe not I can’t say for certain. I also feel that this book could have easily split into two books without missing a beat, not to say I didn’t enjoy the length, just an observation. I really like the classic book references and I’m sure many references that I’m not getting. This is the second book that I have read by Alex Westmore. She has such a beautiful way of storytelling and captivating the audience. I have always been a huge fan of paranormal books and was so excited to read this. I don’t typically read mystery books, so it was a refreshing change of pace from my typical reads. One of my favorite things about this author is that she has such original and unique ideas. I mean who would think to come up with an empath that was named Jane Doe. I feel like being a This is the second book that I have read by Alex Westmore. She has such a beautiful way of storytelling and captivating the audience. I have always been a huge fan of paranormal books and was so excited to read this. I don’t typically read mystery books, so it was a refreshing change of pace from my typical reads. One of my favorite things about this author is that she has such original and unique ideas. I mean who would think to come up with an empath that was named Jane Doe. I feel like being an empath would be such a burden, I mean don’t get my wrong its a super cool power, but then you know everything about everyone. Overall, I loved Echo as a character and felt that she had an amazing story! This book hooked me immediately and continued to be a gripping story! I loved the characters and their relationships, as well as the mystery and how Echo's abilities help solve them. The past and present were interwoven beautifully to get the full picture of how Echo came to be. I highly recommend reading this book! This book is by far my favorite book by Alex. I love Echo, she has such a big heart and I was cheering her on the whole time. If you like heart warming stories about lost kids finding their own family and a home in this huge world, you will love this book. I know I did and I'm really hoping that there will be a sequel. This was a fun read. The idea of supernaturals is an awesome thought too... to day dream about hehe. I look forward to the next book. Wonder and investigate in this wonderful, fantastic story! Visit my site in order to read more reviews like this one @thereadingshelf.co.za! Alex Westmore has lived in a haunted house, has a raging empath for a best friend, and eats up paranormal experiences with a huge supernatural spoon. To get closer to the action, she has spent time with Voodun in New Orleans, medicine men in the Southwest, and a Shaman in the Amazon. Alex is a five-time award winning author of several series, from zombies to demons to empaths, oh my! When she isn’t Alex Westmore has lived in a haunted house, has a raging empath for a best friend, and eats up paranormal experiences with a huge supernatural spoon. To get closer to the action, she has spent time with Voodun in New Orleans, medicine men in the Southwest, and a Shaman in the Amazon. Alex is a five-time award winning author of several series, from zombies to demons to empaths, oh my! When she isn’t writing, she’s thinking about writing and imagining where her next great adventure will take her. Spice up your life! Join Alex on her next amazing adventure… you will be so glad you did.